Affordable beauty and holistic therapies to treat the body and mind with an emphasis on self care. You cannot pour from an empty cup. 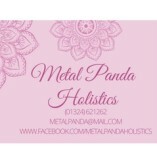 Services range from reiki and herbalism to massage, facials, waxing and nails. I've had a facial and hand massage with Amanda. My skin felt great afterwards. She also brought reiki in as well. Only downside is due to location I wouldn't consider getting a reiki treatment as it's quite noisy. Amanda is constantly increasing the services on offerr to ensure a truly holistic package is available. Amanda takes the time to explain what she is going to do at all times and takes time to ensure the service is right for the clients needs.